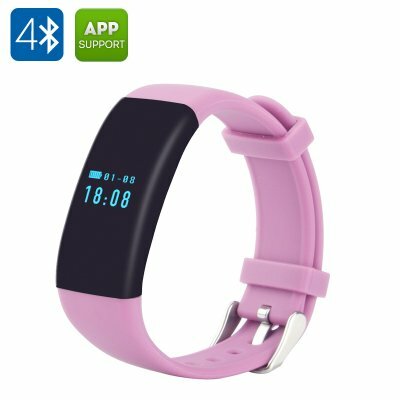 Successfully Added DFit Smart Sports Bracelet - IP66 Waterproof, 0.66 Inch OLED Display, 80MAh Battery, Pedometer, Sleep Monitor (Pink) to your Shopping Cart. The DFit sports bracelet is a great gadget and a fun gift! Stylish, lightweight and coming in bright pink, it’s a great accessory for everyone looking to get in shape or to maintain their progress. Compatible with both Android and iOS smartphones, it’s a simple and efficient little tool to stay healthy. These days, it’s very easy to dive down in work and routine and lose track of what really matters - that is, your health and wellbeing. If you (or anyone you know) lead a busy life with barely a minute to spare, a Bluetooth sports tracker will do a great job of reminding you to leave a little time for yourself. The DFit Bluetooth sports bracelet comes with a built-in heart rate monitor to help you monitor your body and see how it reacts to different workout intensity levels, stress, overtime and more. It will also encourage you to take on more daily activity thanks to the built-in pedometer and burnt calorie counter. Another great feature of the smart sports tracker is the sleep monitor. It’s a great little tool to help you get the most out of a night’s rest and awaken refreshed and full of energy. The bracelet comes wit a nice little 0.66 inch OLED display – bright and clear to display all the needed info for you. More features are available once you hook up the wristband to your smartphone – for instance, you will get notifications about incoming calls. With the 80mAh battery the sports band offers 5 days on standby and won’t require frequent recharging. What’s more, thanks to the IP66 waterproof rating, you will be free to leave it on in any weather.